Corrugated iron sculptures by Glenda Roberts. Seen in Jervois Road, Ponsonby, on the lawns of the Villa, Smyth Galleries. I did wonder what I would find when I saw the title of this post. What a lovely house, beautiful green lawn set off so wonderfully by the sculptures … great find. 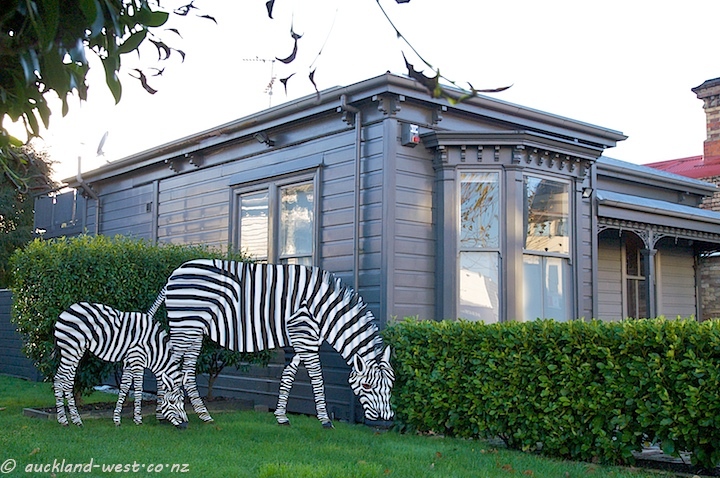 Very fun, artsy ZEBRAS on their lawn! Looks like a beautiful, historic building, too! That’s some lawn art! It made me laugh though, people put iron cactus in their yards here which I find odd since there are plenty of the live variety around!